If you walk into Charlotte White’s home, this is what you notice: colorful potholders hanging from the cabinets. A cat stretched out in a beam of sunlight. And the loud rattle of the washing machine. “It spins off balance, because the floor is uneven, because it’s rotten,” White says. In the hall and the bathroom, the floorboards feel spongy underneath her feet. White had to replace the kitchen floor, too, after it rotted out. White is 64 years old and retired. She lives in a single-wide home in the Rainbow Rock Village mobile home park just off Highway 101 in Curry County, Ore. Her home was built in 1976, the same year the U.S. Department of Housing and Urban Development adopted the first construction and safety standards for homes built on an assembly line. It’s known as the HUD Code, for short. It sets minimum requirements for energy efficiency, strength and fire resistance. In the years since the HUD Code was created — and in particular, after it was updated in 1994 — the quality of manufactured homes has dramatically improved. 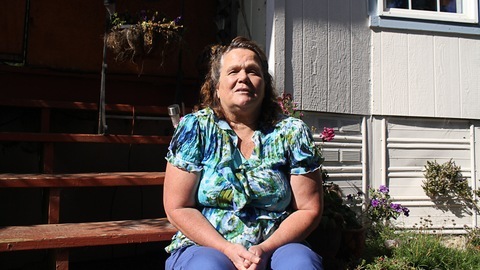 But in the rural Northwest, many people like Charlotte White live in homes that were built before the code was adopted, or that were built to its minimum standards in the 1980s. According to the county assessor, between 25 and 30 percent of the housing stock in Curry County is manufactured housing. Of those, about half were built before 1980. White’s home was not built to last three decades. In addition to the rotting floors, mold has developed somewhere deep in the walls. White has stacks of clothes piled up in the middle of a bedroom. She’s stopped using several of her closets because the mold keeps spreading. “It’s on our clothes and in our shoes. Everything turns green. Sometimes you have to throw those out and buy new ones. There’s something about the mold, it doesn’t leave the fabrics,” she says. 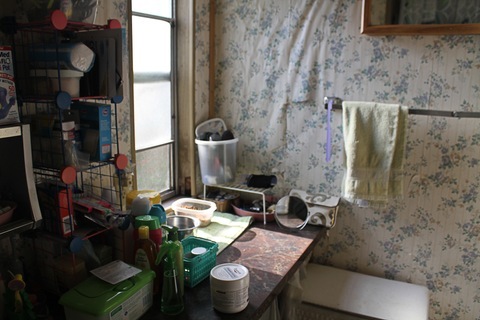 The mold is particularly problematic for White’s daughter, who has asthma. Then there’s the matter of her energy bills. White’s home has minimal insulation. As soon as the heater turns off the cold starts creeping back in through the windows, the duct work and the cracks in the walls. 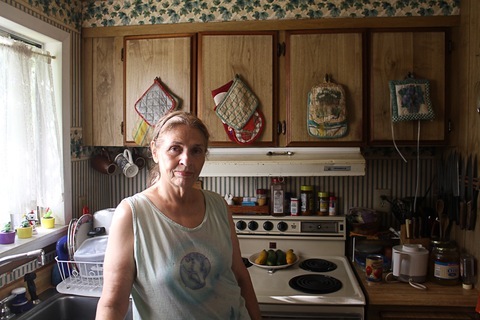 In the winter, to heat this small space, she says her electricity bill runs $280 a month. Her Social Security check is under $400. According to the Environmental and Energy Study Institute, manufactured homes built before 1980 consume an average of 84,316 BTUs per square foot, 53 percent more than other types of homes. A study by the energy consultant group Frontier Associates found that in extreme climates, residents in older manufactured homes pay up to $500 a month for electricity. For some, that is a majority of their income. White has lined the front porch with pots of flowers and ferns, and she can see the sun set over the Pacific. She’s quick to smile and reluctant to complain about her home or her situation. But she does say that friends with much larger homes pay half of what she does for electricity. To help pay the bills, she has a roommate. According to data from the 2006 American Community Survey, in rural Oregon, Washington and Idaho, manufactured homes account for about 15 percent of homes. And in some individual counties, they account for more than 25 percent of the housing stock. Move your cursor over this interactive map to see how many of the homes in your county are manufactured homes. Fixing aging mobile and manufactured homes has become a high priority for Curry County, the local electric cooperative and a host of state agencies and community action groups. The county estimates it has at least 600 older homes that are near the end of their lifespan and need to be repaired or outright replaced. Many of the people living in aging mobile homes are retirees on fixed incomes who can’t easily afford to make repairs or finance a new home. Annette Klinefelter works for the Curry County Public Health Department. She says the condition of the homes creates health risks for the occupants. “They weren’t necessarily designed for a climate like Curry County that’s wet and damp and has high winds. And when they’ve outlived their life cycle and they begin to break down, the water enters, the dust mites enter and the vermin enter. It results in indoor air problems that impact people’s health,” she says. Klinefelter is particularly concerned about two chronic conditions: asthma and arthritis. She says along with diabetes and heart disease, asthma and arthritis are among the most common chronic conditions in the county and a major source of health care spending. She believes fixing up dilapidated manufactured homes can prevent asthma, helping aging residents maintain their mobility, and avoid ending up in a nursing home. Karen Chase with Oregon Housing and Community Services agrees. She says improving the quality of homes is a strategic way to approach community health, given how much time Americans spend indoors. “When we’re spending up to 90 percent of our time indoors and up to 70 percent in our residential housing, the quality of that housing really matters for the health of the people living in it,” Chase says. Klinefelter and Chase are key players in a plan supported by Oregon Governor John Kitzhaber to begin repairing and rehabbing the manufactured homes in Curry County. Last month, in partnership with the nonprofit group NeighborWorks Umpqua, the county launched an initiative called reHome Oregon. The goal: replace 25 old manufactured homes with new, Energy Star certified models. They also want to help hundreds more manufactured homeowners make repairs with the help of small grants (up to $5,000) and rebates for energy efficiency through the Coos-Curry Electric Cooperative. Though it may not sound ambitious, reHome is one of just a handful of efforts across the nation working to tackle the aging manufactured home problem. The Pacific Northwest has a reputation for pioneering energy efficiency and quality in manufactured housing. Due in part to partnerships between the home building industry and Bonneville Power Administration, since 1989 two-thirds of manufactured homes in the Northwest have been built to high efficiency standards, according to the American Council for An Energy-Efficient Economy. In the past, most community advocates — and banks — viewed manufactured homes as an asset that quickly depreciated and became a liability. Now, some advocates like Chase believe new manufactured homes are often built quite well and can provide a valuable low income housing option. But, these new manufactured homes are prohibitively expensive for people like Charlotte White who live in older models that have lost their value. The cost for a new, energy-efficient single-wide runs $60,000 or more. NeighborWorks Umpqua has a complicated plan for how to make manufactured home replacement more affordable through the reHome initiative in Curry County. First, the group will use grant funding to fully cover the cost of removing outdated manufactured homes. The old homes can contain asbestos and lead paint, and cost up to $5,000 to get rid of. Second, the group is negotiating discounted prices and transport costs with manufactured home builders. Finally, the crux of the reHome Oregon initiative is to help people purchase replacement manufactured homes with low interest loans from groups including the USDA Rural Development Housing Program and the Network for Affordable Housing. Whether or not reHome Oregon succeeds may ultimately hinge on the USDA Rural Development Program’s degree of commitment to the initiative. In 2012, just two of the 2,771 loans the federal agency made or guaranteed in Oregon were to manufactured homeowners. That year, the agency also made or guaranteed just five loans for manufactured homes in Washington and three in Idaho. In an e-mail, USDA Rural Development spokeswoman Jill Reese said a number of obstacles make it difficult for manufactured homeowners to participate in the loan program. For example, the agency only makes loans to individuals who own both the home and the property it’s built on. Many manufactured homes are sited on leased land in parks. Reese said it has also been difficult for the agency to find banks to partner with because a typical homeowner’s loan is 30 years and the lifespan of mobile homes is viewed as too short. However, she’s optimistic the agency will be able to work with Curry County and the reHome program. She says the agency has recruited Eagle Home Mortgage in Tigard to help finance some of the manufactured home loans. For her part, Charlotte White is interested in getting help from the new program, but says she has had difficulty qualifying for home loans in the past. “If I had enough money or collateral to get a loan, I would. I don’t. I know that I don’t, so you kind of get stuck between a rock and a hard place,” White said. Neighborworks Umpqua says it is looking for additional grant funding to help people who are living in pre-1976 manufactured homes but cannot afford to make monthly payments on a loan. The reHome program will begin taking applications from manufactured homeowners looking to make repairs or replace their unit in January 2014.